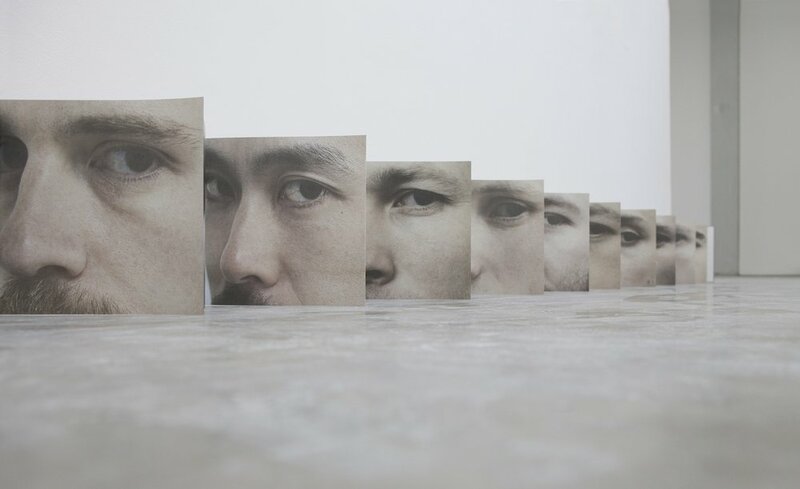 Yu Feifei's Lovers' Eyes uses the form of folded paper, displayed on a screen, both occupying the space and dividing it. The left page of the fold shows the face of a Greek sculpture in the British Museum, the right page is the face of a modern man. Eyeing Greek sculpture faces the modern man directly, yet these men are both eyeing the spectator. The space in front of the classical sculpture and modern man forms a triangular chain of vision, which overlaps in the three spaces. The starting point of the artist's creation is the male “gaze”, but this work is precisely anti-gaze. It consists of 20 faces, 10 ancient and 10 modern, on left and right zigzagging folded paper. The images cannot be captured by a static, xed gaze. They presuppose a moving viewer, glancing left to right or right to left. By this wandering, reciprocating movement, the dimension of time is brought into play.